Himalaya Journey Treks & Expedition:: Gorkha package tour | kathmandu Gorkha tour | Kathmandu Gorkha package tour | Kathmandu Gorkha tour information | Gorkha pokhara tour | Chitwan Gorkha package tour | Pokhara Gorkha package tour | Dhulikhel Gorkha package tour | Gorkha Nagarkot package tour | Nepal tour information. Day 01: Arrival Katmandu , transfer to hotel & wel come diner. Day 02: After breakfast, half-day sightseeing tour of Pashupatinath Temple, Bouddhanath and Swayambhunath stupas. Day 03: After breakfast, either departure transfers to airport for flight to Pokhara or overland transportation to Pokhara. Transfer to hotel and spend the rest of the day at leisure. Day 04: After breakfast, half-day tour of Pokhara. 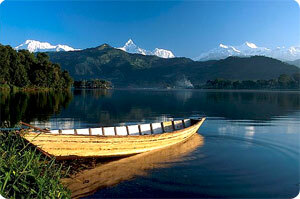 One-hour boat rides on the Fewa Lake after lunch. Day 05: After breakfast, depart by road for Gorkha. After lunch, visit the historical Gorkha Durbar. Overnight at hotel. Day 06: After breakfast, leave for Chit wan where you will check into lodge. Exciting jungle activities in the afternoon. Day 07: Full day jungle activities. Day 08: After breakfast, either departure transfers to Bharatpur airport for flight to Katmandu or overland transportation to Katmandu. Arrive in Katmandu and transfer to Nagarkot/Dhulikhel. Overnight at resort. Day 09: After viewing sunrise and the mountains, leave for Katmandu. Visit Bhaktapur Durbar Square en route. Arrive in Katmandu and spend the rest of the day at leisure. Day 10: After breakfast, leave for half-day sightseeing tour of Katmandu and Patan Durbar Squares. Rest of the day at leisure & fare well diner. Day 11: Back to onward destination. 10 days VIII. Katmandu - Pokhara - Chitwan – Nagarkot. 20 days XI. Cultural Tours in Nepal.